The Airstream still feels like home to us, even though it is sitting in the carport with half of our possessions taken out of it. But it isn’t home anymore, and so we have been systematically reducing its contents to only what we envision we’ll need for specific trips. It’s an awkward process, full of questions and uncertainties. Everything has to be re-examined. The key criterion is simply whether we will need it if we’re out for a month or two. Before we were full-timers, we did what most people did. We kept a minimum complement of equipment and supplies in the trailer during the summer season, and reloaded many other things in the days leading up to departure. Now I’d like to keep this trailer ready for immediate travel without a lot of reloading. That means duplication of many things that we use in both the house and trailer. Most of it is easy: toothbrushes, shampoo, dishes, bedding, some clothes. Anything in the house that is needed on the road and is reasonably cheap will have a permanent counterpart in the trailer. We have enough clothes to leave a four-season supply in the trailer and still have what we need in the house. Toys that we only use during travel will stay in the Airstream too, like our snorkel gear and wetsuits. A few things like my office equipment (laptop, printer, cellular router) and Eleanor’s perishable spices will have to be loaded at the last minute. That means we’re organizing the house to suit the trailer. All of my office gear stays in one cabinet in the house. All of Eleanor’s key spices are in a simple plastic bin in the kitchen. When it’s time to go, we grab the contents of the office cabinet and the spice box and we’re ready. Of course, it’s not quite that simple, but the goal is to be able to take off on impromptu trips without agonizing over packing. I hate the question, “Did we remember to pack the ______?” With a well-designed system, I hope we can get the Airstream ready to go for a week-long trip in less than an hour. It’s also nice to have the Airstream ready for habitation in the unlikely event of a natural disaster or other event that might require evacuation. That’s unlikely here in Tucson, where the chance of forest fires, hurricanes, tornadoes, earthquakes, tsunami, mudslides, and floods are minimal. All we get are severe thunderstorms during summer and the occasional dust storm. But maybe someday they’ll have a problem at the Palo Verde Nuclear Generating Station. I think with a little more prep, we could get out of here in 10 minutes and not miss anything important for weeks. For a lot of people, the amount of travel we still plan to do is formidable. We’ll be gone much of the year, including all the summer months. I was talking to a neighbor today about our plans and I could see his startled reaction as I said, “Well, of course we’ll be gone all summer.” I have to remind myself that while it seems like nothing to us to be living in the Airstream for a few months, it’s a very big deal to most people. So we will still carry things that weekenders wouldn’t bother with. We’ve got extensive laundry and cleaning supplies, extra tools, spare parts, reference books, dishware for guests, and a lot of food. The next major trip is scheduled for after Christmas, although we are likely to go out for a few days here and there in November. The post-Christmas trip has no definite end planned to it; we may be out for as little as eight days or as much as a month. I’ve never thought much before about what it takes to store the trailer for long periods. It needs a certain amount of TLC to stay ready for the road. For example, the water system needs sanitizing. Bleach is the usual method, mixed with a full tank of water and run through all the faucets. A measured amount in the system for a few hours will kill all the bugs. I’ve put a smaller amount of bleach in the system for storage, to keep it from growing bacterial slime while the trailer sits. Mostly, this is compensation for not traveling as much. I like the idea of the Airstream staying “live” and ready, just like it was during our full-timing days. We are living as homeowners now, and it’s a big change, but the shock is mitigated a little by the knowledge that our escape pod is right there, ready to go. We may do just fine in suburbia and not need it, but it’s nice to have. There were many reasons we decided to settle into a house without wheels for a while, but one was to get serious about my small business. For the past three years I’ve juggled work and travel, and it has worked, but I often felt that if I spent more time concentrating on the business, I’d be able to come up with ways to make it run better. Parking ourselves in a house would yield bonus time that was formerly spent driving and dealing with other overhead associated with travel. The economic recession has only spurred the need for me to really concentrate on the business. Niche magazine publishing is not a great way to get wealthy even in the best of times. With a worldwide economic crisis coupled with a recession in the RV industry, my little magazine is in the crosshairs. We’ve already been pummeled a bit in 2007. While people keep subscribing to Airstream Life at the same rate as the previous year, several advertisers have abandoned most or all of their advertising program. (Talk about a self-defeating strategy. People are still traveling and using their Airstreams — check any state park or campground for proof.) Panic is never pretty, and it’s never the right choice. I’m writing very frankly about this because I think there need to be a few voices to counter the constant negative bombardment in the popular media. People are getting too caught up in what happened on Wall Street this morning, and forgetting to see the bigger picture. There are opportunities in a downturn. In times of war, promotions happen fast. You can sit on the sidelines and wait for it all to be over or you can get in the game. However you say it, adopting a position of passive fear or active retrenchment is not going to advance your cause. The RV industry slowdown has been apparent since the beginning of 2007, so we’ve been working to mitigate the damage all year. To get the message out, Brett has posted some essays about the value of advertising in a downturn, and privately he’s been counseling our advertisers on ways to intelligently respond to market conditions. A few have listened, and they seem to be surviving very well. The companies that understand the value of marketing intelligently when others are running scared will have long-term advantage over their competitors. Of course, when you sell ads to people, those ads had better work. So we’ve offered free ad re-designs to our clients, to improve the results they get from their ads. Those who have taken advantage of that service are reporting great results. We’ve also been seeking out small businesses with relatively recession-proof business models, as new clients, and we opened up a new — inexpensive — advertising section just for them. We’ve also offered creative ways for our advertisers to be able to afford their ads, including accepting credit cards and product or service trades. But in the last few weeks, it has become obvious to everyone (even the Commander-in-Chief, the Secretary of the Treasury, and Alan Greenspan, apparently the last three people to figure it out) that the financial crisis is deeper and will last longer than at first expected. That means my efforts have to go far beyond just shoring up the current clients and seeking new ones. It’s time to look for efficiencies and cuts that can help sustain us for a long time. Now, all this might seem enormously depressing. I admit that at first I was dismayed as well, but then I realized that finding efficiencies in my business could actually be fun. Like selling, it’s a task that can be a rewarding game. The trick to stretching a recipe is to make the end result taste the same, and that requires creativity, which is the fun part. So every few days I try to come up with another idea to either save money or increase revenue. The ideas can range anywhere from sweeping changes to little tiny ones. It doesn’t matter how big the savings are, just that I keep coming up with new ideas. I figure that if I keep up the challenge long enough, eventually I’ll find ways to secure Airstream Life against the storm. Other ideas: We’re reducing complimentary copies sent to advertisers, to cut waste. We’re using a slightly lighter paper on the magazine cover. I switched my Amex card from a Gold card with $100 annual fee, to a no-fee card that gives 5% back on fuel purchases. We’re offering discounts to advertisers who pay for their ads early. I’m cutting back on travel mileage and rallies (but still planning at least five months of travel in 2009). We’re promoting back issue sales a little more aggressively. It all helps. Some ideas actually increase our expenses but will pay off in the long run. For example, we switched web hosting providers. The new web host costs $500 per year (compared to $99 per year for the old one). But the magazine will save money and time overall, because the new host is much more reliable and I won’t have to pay a tech $1,000 per year to fix the problems caused by the cheap-o service we used to use. I’ve also looked at the long term, and used the “what-if” scenarios to develop strategies to ensure that we’ll be a survivor no matter what happens. That means having a plan for emergencies, building up savings, reviewing and sometimes renegotiating contracts, etc. That’s good too. In the past few months of thinking about this, I’ve come up with literally dozens of small changes that have made the business more profitable. Some of them are big ideas that will take months or even years to implement. A lot of them are penny-ante things. But even if they don’t add up to a lot of financial difference, it has been worth the exercise simply for the improvement in efficiency. Because I’ve been forced by economic conditions to re-evaluate everything, the business has been improved — tempered by fire, in a sense. So I am glad for the challenge. The slump, downturn, recession, or whatever you care to call it, has been a good thing. Once in a while a little bump is good to shake you out of your complacency. Our advertisers will get better service from us, the business will be stronger, and you’ll keep getting Airstream Life magazine. So never mind what’s happening on Wall Street this week. Don’t get paranoid and start stocking up on beans, Band-Aids, and bullets. Plan to thrive on the downturn and you’ll be one of the first folks to smile when things turn around. The hardest thing in the world, apparently, is getting rid of a lawn. This is something I cannot fathom. I have known many a lawn-lover to moan over the large brown patches that afflict his treasured grass, caused by grubs or drought or incorrect pH balance or some other such thing. A lawn seems a delicate thing when you want it to be just right, and it drives owners to outdoor centers to buy enormous bags of fertilizers and pesticides. Green perfection is expensive and time-consuming. And yet, when you decide you’ve had enough of grass, just try to kill the stuff. It’s impossible. The roots, say landscape professionals, go down deep. Grass has amazing ability to go dormant, survive frosts and droughts, and shrug off even brutal chemical assaults of glyphosate. Or so I’m told. Our house in Tucson had a lawn, once upon a time. Being neglected since the death of the prior owner, the lawn has become a mess of weeds that carry thorns and provide cover for critters. Our departure for six months certainly didn’t help things. Now, instead of a lawn, we have a sort of jungle. Still, many times when we saw a house during our search, the realtor would slide open the patio door to the back yard, take a peek, and announce with a sigh, “And yes, there’s a lawn.” He knew how much I hated to hear that. These “lawns” would typically be little 12×12 patches of carefully tended grass in the midst of a lot of gravel. They were usually just large enough for the kids to play on, like little putting greens without holes for the golf ball. When I saw these I always imagined some desperate northerner trying to keep a tiny bit of his home landscape alive in the backyard. Turns out that in reality they are put in by life-long desert dwellers who think a patch of green grass is a status symbol. That’s like northerners keeping a gila monster in a backyard cage. It doesn’t make much sense to me but it makes some people happy. The preferred landscape today — and the one mandated by current codes for multifamily and commercial buildings — is xeriscape, which means a combination of gravel, rocks, and desert-adapted plants that don’t need much water. Xeriscaping is also conveniently low-maintenance, perfect for our lifestyle since we will be gone a lot. So our goal from the minute we agreed to buy this place has been to utterly eliminate the grass and restore the backyard to a more natural desert landscape. If all we were facing was a 12×12 foot patch of grass, this would be a trivial exercise. But the previous owner of our house had a full-on, wall-to-wall carpet of grass in the backyard. From archive images from the satellite photos, it looks like he took care of it with plenty of water. That means we have about 2,000 square feet of grass to eradicate. (There is no middle ground. Grass does not negotiate. It’s kill or be killed.) You’d think that in the desert it would be easy: just stop watering and watch the grass die. Unfortunately, we have a fairly well-adapted version of grass that bides its time until the rain comes, and thus survives on the mere 12 inches of rain that Tucson gets annually. The first landscaper who visited us suggested the most reliable solution: “simply” remove the top four inches of soil and truck it away. I would “simply” write a check for $2,000 for this service — and then we’d talk about replacing that giant expensive divot with something else. My problem with that solution is that I don’t want to spend a lot of money to get rid of something as dumb as grass. My whole purpose in getting rid of the grass is to avoid spending money to take care of it, and it seems counter-productive to start the process by spending a big pile of money. I suspect the best way to get rid of the lawn is simply to act as if we care about it. We could buy a nice riding lawn mower, several bags of chemicals (fertilizer, pre-emergent grub control, dandelion inhibitor), a few manual tools like rakes, an aerator, and some sprinklers. The grass would detect this and promptly go brown. But who am I kidding. The lawn would probably know I was bluffing. It’s decisions like this that make me wish for a quick escape into the Airstream, where such problems are always somebody else’s to manage. I always appreciated beautiful green lawns when we lived in the trailer, because I could dip my bare toes into them knowing that I wouldn’t be the one mowing later. It’s a real temptation to just skip the decisions and start planning a getaway instead. And there’s a justification there, too: with some time off to think and recreate, a brilliant solution may come to me. So it’s settled. I’ll start planning the “Grass Solutions Tour 2008” as soon as possible. Folks, this could be a real phenomenon if it works. Imagine the justifications you can make if it turns out that a simple getaway allows you to solve life’s problems. Our motto will be this: “For every problem that comes up, there shall be a trip.” And the trip length can be a factor of the difficulty of the problem. For the grass problem alone, we may be on the road again for quite a while. When we lived in Vermont, there were two big fall rituals that we observed without fail. In late September, we’d go to a pick-your-own apple orchard and gorge ourselves on Cortland apples. And in mid-October, we’d go to the pumpkin patch and pick the biggest pumpkins we could find for carving. Pick-your-own (PYO) is a lot of fun. Sure, a cynic might take the view that we’re paying for the privilege of doing farm labor, but there is something to be said for getting out of the supermarket and browsing a pumpkin patch, blueberry grove, or apple orchard to find your food with your own eyes and hands. There’s the earthy greenness combined with a festive air, as people happily go digging through the branches and leaves to find the perfect fruit. There’s the sense of getting closer to the source of your food, buying it right off the farm rather than picking through fruit that came in on a jet from Argentina. As Linus so aptly described them, pumpkin patches — and other farms — are places where you can still find sincerity. We often grew our own pumpkins in Vermont, since we had acreage. Our pumpkin patch occupied half of our 50×50 ft garden, and except for the year when we grew sugar pumpkins that the rabbits liked, we usually harvested a couple dozen pumpkins of various sizes. Helping find pumpkins among the giant green leaves, and stack them in the wheelbarrow, was Emma’s first outdoor job at the age of two. 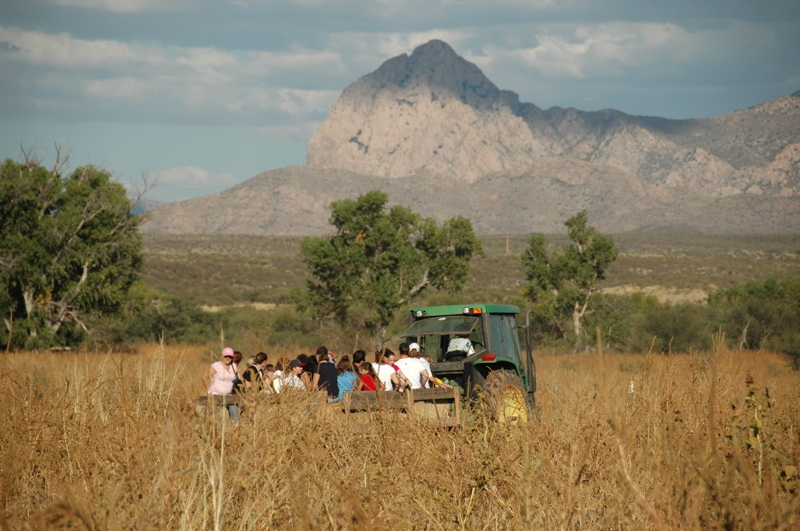 Now we are suburbanites, and our backyard is not yet ready for gardening, so we decided to take part of Saturday to drive down to a farm about forty miles south of Tucson for a little PYO action. We had promised Emma the opportunity to repeat the pumpkin-picking tradition and since we were visiting Tumacacori National Historic Park anyway, the farm was right up the road. We had no idea what he was talking about. He appeared to be a disgruntled customer, and that seemed a shame on a sunny afternoon at a pick-your-own-farm. Meanwhile, throngs of families with small children were converging on the haywagon that was carting people off to the further reaches of the farm. We hustled over and got in line. After a few minutes, we realized that we could walk to the drop-off point for the haywagon in much less time than we would be waiting in line, so we started off. In three minutes we were at the designated spot, and ready to tackle the pumpkins. Except for one thing: this didn’t look like the pumpkin patches we remembered. There were weedy plants everywhere obscuring the pumpkins. These weeds were dry and looked like Russian Sage (tumbleweed) but tall instead of bush-shaped. It looked like a demented hayfield. Still, naive as we were, we plunged into the field in search of pumpkins. Have you ever accidentally stood atop a red ant hill while wearing sandals? Ever waded waist-deep into a field of stinging nettles, while wearing shorts? Ever walked into a live electric fence? I have, and I can tell you that all of those experiences were sheer pleasure compared to the experience of walking into this pumpkin patch full of weeds. It was an excruciating form of torture. With the first gentle brush, the weeds shed thousands of tiny spikes which immediately embedded themselves in our clothing and skin. Our mistake was immediately evident: at dozens of points on our bodies we were being impaled by enemies too multitudinous to fight. Every step ground the little spikes further into my socks, drove them deeper into my shirt, and increased the threshold of pain. We were all struck with an immediate desire to flee this field of nightmares, but escape was just as excruciating. Only by remaining motionless could we get relative relief, and that was not a useful option. At this point, I realized that we weren’t the only ones suffering in the field. Nobody was smiling; only men with blue jeans and boots were adequately protected, and they were in the field looking for pumpkins on the orders of their family members, who were standing safely in the dusty tractor road. I looked at my short black socks, and saw that they were tan with thousands of loosely attached spikes. I was not dressed for this battle, and neither were Eleanor and Emma, who were now struggling to find a safe place to stand without pain. Like quicksand victims, struggling only hastened our fate. Pick your own pumpkins? At this point we wanted nothing more than to jump up on that haywagon and head to the nearest concrete-lined supermarket. 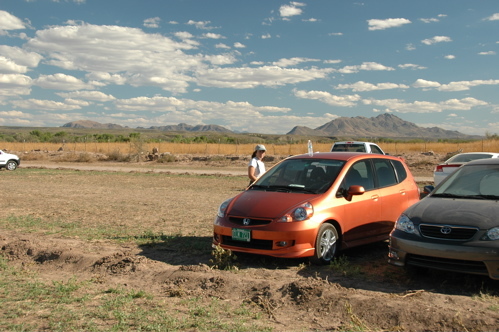 But we had come all this way, forty miles from Tucson, half a mile down a one-lane dirt road, and $7 for admission. We came to pick pumpkins in a field, and by golly, we were going to pick pumpkins, or die trying. I can only assume that the same attitude was driving the other victims of this wholesome family experience, because like us, they were wading into the cruel weeds and picking out pumpkins with fixed and determined grimaces on their faces. In the end, we came out with three pumpkins in our arms, and thousands of brutal thorns embedded in our clothing. The pumpkins were a bit small for carving but nonetheless symbols of our bravery and willingness to bear up against pain in the honorable quest for holiday gourds. I cannot say that this experience gave us that special feeling of having once again shared a treasured tradition. I think our emotions initially ran more to a sense of thankfulness for mere survival. By the time we reached the parking lot, we had shed most of the irritants attached to us and were back to smiling, but it was the smile of the person who has just left the dentist’s office after a root canal. Next year, we’ll look for a pumpkin patch with a little more sincerity — and a lot fewer thorns. When we were traveling full-time, one of the questions I got often about life in the Airstream regarded maintenance. People were concerned that routine service and repairs of the trailer would be an onerous burden. Typically this question came from someone who was considering going “full-time” in an RV. They expected that moving from a fixed house to one that was mobile would greatly increase their obligation to clean, lubricate, adjust, and repair things. Actually, the opposite is true. While full-timing, we averaged a few hours a month maintaining (or watching the repair of) one thing or another, which amounted to an annual expenditure of about $2,000 – $3,000 and a few days. It was never burdensome. Once we moved out of the house, it was amazing how much free time we had. Of course, now the situation has flipped on us again. We’re in a house, and despite our best efforts to make it low-maintenance, it has surprised us with a seemingly endless list of fittings it requires in order to be usable. In the past week I’ve purchased chairs, toilet paper and toothbrush holders, bookcases, drawer organizers, nightstands, knobs, and various bits of hardware. We still need shades in one window, rugs, storage bins, end tables, and a dozen other things. This feels very odd to us. We bought a house but it came with no place to put things. We’re used to the Airstream, which came to us completely ready for living, fully furnished and organized. We didn’t have to go shopping for appliances, check for mattress sales, or measure the windows for curtains. The Airstream came with everything, right down to the storage bins. By comparison, houses are just shells that need a ton of accessories to be usable. The price you pay for the house is just the start. This focuses your attention on the house, and you of course immediately start running errands to get stuff to line the nest, which is what we’ve been doing lately. Being 98% fully functional right out of the lot, the Airstream allowed us to focus on doing things and going places. We didn’t spend a lot of time thinking about which stove to buy. We just hitched up and went. Now that we are in the house-furnishing mode, I think wistfully back to that and realize what a good deal it was. Yesterday’s big errand was 100 miles up to Tempe, where IKEA sits in a giant blue-gold box by the Interstate highway. I know, a few blog readers are wincing because they despise IKEA. But hear me out. We made a conscious choice even before we bought the house that we would not put anything really worthwhile in it. Our last house was furnished with antiques and a few really nice (expensive) pieces of furniture that would certainly last a lifetime. When time came to move, we had to sell most of that furniture at a fraction of what it cost us (or give it away) because there was no real market for it. The cost of moving it across the country almost equalled the cost of the furniture in the first place. We moved only a bed frame and the dining room table. When we got here, knowing that this would not be a “dream house” and that we’d probably spend very little time in the house, we decided not to repeat that mistake. Who knows if we’ll be here five years or 50 years? Thus, we are buying essentially disposable furniture at extremely modest cost. That means IKEA. Seventy bucks gets me a veneered particle-board bookcase that can be disassembled later if needed. Honestly, the furniture in the Airstream is more durable than the IKEA stuff, but on the other hand, we furnished the entire house with IKEA for about $2,000. Heck, just the dining room table that we moved from Vermont cost more than that. The real problem with IKEA is that in its constant effort to emphasize its Swedish roots, all the products are given bizarre and confusing names. The BILLY bookcases we bought are easy for a North America tongue to handle but things quickly degenerate from there. The optional doors are called BYOM, for reasons fathomable only to Swedes, I suppose. We have chests of drawers called MALM, and if we’d dared to shop the bedding we’d be looking at MYSA and GOSA. The mirror is called MONGSTAD, which is bad enough, but the EKTORP couch just makes me laugh. Reminds me of “ectoplasm.” Pair it with a lovely LEKSVIK coffee table and a TULLSTA chair and you’ve got a tongue-twisting living room for under $1,000. No, I’m not making these up. The names make me wonder if they are (a) really Swedish; (b) made-up for the US market, like Haagen Dazs; (c) randomly generated by computer or a cat walking across the keyboard. I mean, honestly, is DOMSJO a word or a typo? In various places she’s also hung sticky notes with hints to herself about where things might go in the future. One by an empty cabinet says “Spices & baking needs.” There’s another one on the cabinet near my computer that says, “Coffee station,” but the coffee maker is still on the other side of the kitchen. I could ask why but I’m afraid to know. I think she’s waiting for me to find some place other than her kitchen to keep my office. Today I have to assemble some BILLYs, attach the BYOM doors, and then install a few GRUNDTAL pegs for hanging kitchen towels, and two SAGAN toilet paper holders (named for Carl Sagan?) Eleanor is attaching KORREKT handles, correctly I hope. In between, there’s the hunt for everything that we remember owning but can’t find, including things that are still in boxes back in our “storage” room, and roving items in the kitchen. It’s all very confusing. We do this in the hopes that at the end of this process (which currently has no end in sight) we will have a house that is finally furnished for living. So, in answer to anyone who is still wondering, yes, the Airstream was definitely simpler.